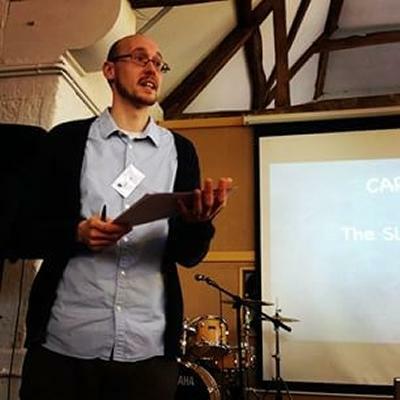 Dr Daniel Ashton is an Associate Professor and the Programme Leader for MA Global Media Management within Winchester School of Art at the University of Southampton. I teach and research in the fields of media, communication and cultural studies. I have published my research on topics including digital media technologies, creative industries labour and policy, and participatory cultures. I have taught on undergraduate and postgraduate course and am a PhD supervisor. I have also worked in partnership with a range of cultural organisations on public exhibitions, teaching initiatives, and research bids. I research in the areas of media, cultural and creative industries and participatory cultures. My AHRC funded PhD (Lancaster University) examined working in the creative and cultural industries and questions around identity and relationships with digital technologies. I am the co-editor of Cultural Work and Higher Education (Palgrave Macmillan), and have published work in a range of academic journals, including: Convergence; Journal of Education and Work; Journal of Cultural Economy; Games & Culture; Fibreculture; and Television & New Media. I am currently undertaking research on arts funding with a number of Southampton-based arts organisations. This research is supported by the Winchester School of Art Strategic Research Fund. Other recent research activities include: running an inter-disciplinary research workshop with Dr Brian Hracs (Geography, University of Southampton) on the translocal nature of cultural scenes; giving a keynote presentation at the University of Nanjing; and publishing chapters in the The International Handbook of Media Literacy; Community Filmmaking: Diversity, Innovation, Policy and Practice’; and The 'new normal' of working lives: critical studies in contemporary work and employment (with Karen Patel, Birmingham City University). With Dr Seth Giddings, I am co-director of the Transforming Creativity research group. This research group brings together researchers from WSA, across the University, and externally to explore transformations in cultural production and creative economies. I have also participated in PhD admissions interviews, upgrade panels, and thesis examinations. I welcome hearing from those interested in undertaking research at WSA/University of Southampton in the following areas: arts funding; creative and cultural industries; digital cultures; media industries, organisations and production; participatory cultures. Ashton, D. (Accepted/In press). Railway arches, entrepreneurs, and culture-led urban regeneration. Cultural Industry Research, 17(2), 244-252. Ashton, D. (2016). Muhammad Ali: mourning another great in the age of social media. The Conversation. Ashton, D., & Couzins, M. (2015). Content curators as cultural intermediaries: “My reputation as a curator is based on what I curate, right?”. M/C Journal, 18(4). Ashton, D. (2013). Hid(ing) media professionals: constructing and contesting the 1st AD. View: Journal of European Television History and Culture, 2(4). Ashton, D. (2011). Media education and media industries: identity, anxiety, and aspirations. Media Education Research Journal, 1(2), 85-93. Ashton, D., & Newman, J. (2011). Slow play strategy: digital games walkthroughs and the perpetual upgrade economy. Transformations, 20. Ashton, D., & Newman, J. (2010). Relations of control: walkthroughs and the structuring of player agency. The Fibreculture Journal, 16(110). Ashton, D. (2010). You just end up feeling more professional: media production and industry-ready personhood. Networks, 10, 14-19. Ashton, D. (2009). Critical thinking across contexts. Politics and Culture, 10(4). Ashton, D. (2009). Interactions, delegations and online digital games players in communities of practice. Participations: International Journal of Audience Research, 6(1), 1-24. Ashton, D. (2009). Media studies and the industry-ready agenda. Networks, 29. Ashton, D. (2009). Thinking with games: exploring digital gaming imaginaries and values in higher education. Journal of Media Practice, 10(1), 57-68. Ashton, D. (2008). Digital gaming upgrade and recovery: enrolling memories and technologies as a strategy for the future. M/C Journal, 11(6). Ashton, D. (2008). Policy, productivity, passion and piracy: drawing lines around innovation in a knowledge-based economy. eSharp, 12, 1-24. Ashton, D. (2016). From campus to creative quarter: Constructing industry identities in creative places. In R. Comunian , & A. Gilmore (Eds. ), Beyond the Campus: Higher Education & Creative Economy (pp. 21-40). Abingdon: Routledge. Ashton, D. (2014). The expertise of illness: celebrity constructions and public understandings. In L. Van Brussel, & N. Carpentier (Eds. ), The Social Construction of Death: Interdisciplinary Perspectives (pp. 114-134). Basingstoke, GB: Palgrave Macmillan. Ashton, D., & Noonan, C. (2013). Afterword: further and future directions for cultural work and higher education. In D. Ashton, & C. Noonan (Eds. ), Cultural Work and Higher Education (pp. 254-264). Basingstoke, GB: Palgrave Macmillan. Ashton, D., & Noonan, C. (2013). Cultural work and higher education. In D. Ashton, & C. Noonan (Eds. ), Cultural Work and Higher Education (pp. 1-21). Basingstoke, GB: Palgrave Macmillan. Ashton, D. (2013). Industry professionals in higher education: Values, identities and cultural work. In D. Ashton, & C. Noonan (Eds. ), Cultural Work and Higher Education Basingstoke, GB: Palgrave Macmillan. Ashton, D. (2012). Archives and prefigurative practices: digital games walkthrough archives as record and resource. In N. Bose, & L. Greiveson (Eds. ), Using Moving Image Archives (pp. 101-104). Nottingham, GB: University of Nottingham. Ashton, D., & Newman, J. (2012). Tips and tricks to take your game to the next level: expertise and identity in FPS games. In G. A. Voorhees, J. Call, & K. Whitlock (Eds. ), Guns, Grenades, and Grunts First-Person Shooter Games (pp. 225-247). London, GB: Bloomsbury. Ashton, D. (2008). Simple, meaningful graphics: digital gaming counter-mobilisations and the politics of graphics. In G. Grindon (Ed. ), Aesthetics and Radical Politics (pp. 26-41). Newcastle upon Tyne, GB: Cambridge Scholars. Ashton, D. (2019). Forms of F(r)iction. Paper presented at Friction Research Day, Centre for Modern and Contemporary Writing, University of Southampton, . Ashton, D. (2018). Communities of care: honour amongst thieves and solidarity amongst social media influencers. Paper presented at CAMEo Annual Conference 2018: Care in the Media and Cultural Industries, Leicester, United Kingdom. Ashton, D. (2018). Discussion paper on the cultural work of funding. Paper presented at European Colloquium on Culture, Creativity and Economy, Stockholm, Stockholm, Sweden. Ashton, D. (2018). Participatory place, heritage and future: The role of creative entrepreneurs in culture-led regeneration. Paper presented at Digital Suzhou, Suzhou, China. Ashton, D., & Bennett, T. (2018). Roundtable: Local, Global, Crap or Creative? Charting a course to creativity. Paper presented at Creativity, Knowledge, Cities Conference, Bristol, United Kingdom. Ashton, D., & Comunian, R. (2018). Universities as creative hubs: modes and practices in the UK context. Paper presented at RGS-IBG Annual Conference, London, United Kingdom. Ashton, D. (2017). 'and yes, it does count spaces as a character’: constructing and communicating cultural work through funding applications. Paper presented at CAMEo 2017 Mediating Cultural Work, United Kingdom. Ashton, D. (2017). Funding the arts: stories, relationships, form and word counts. Paper presented at Affects of Funding in the Arts, Southampton , United Kingdom. Ashton, D. (2017). Railway arches and entrepreneurs: sustainable creative industries urban regeneration?. Paper presented at 2017 Sino-British International Summit of Cultural and Creative Industries, Nanjing, China. Ashton, D., & Patel, K. (2017). Vlogging labour: everyday and always on. Paper presented at The Digital Everyday: Exploration or Alienation? , London , United Kingdom. Ashton, D., & Long, P. (2016). For the love of the thing: conceptualizing the role of the amateur in the contemporary cultural ecology. Paper presented at European Communication, Research and Education Association , Prague, Czech Republic. Ashton, D., & Long, P. (2016). To a professional standard? HE, creative education and the amateur. Paper presented at European Sociology of Arts - Arts and Creativity: Working on Identity and Difference, Porto, Portugal. Ashton, D. (2016). YouTube comments and contesting participatory promises. Paper presented at QUEST (Qualitative Expertise at Southampton) Seminar, Southampton , United Kingdom. Ashton, D. (2015). "A bottle of white spirit, a pair of Marigolds and a scraper”: contesting career pathways in film and television production. Paper presented at New Directions in Film and Television Production Studies, United Kingdom. Ashton, D. (2015). "How-to” entrepreneurs making Minecraft make money: expertise, identity and digital culture. 191-191. Paper presented at WORK2015-New Meanings of Work, . Ashton, D. (2015). Creative labour in the bedroom and on the web. Paper presented at Challenging media landscapes, Manchester, United Kingdom. Ashton, D. (2015). From ‘keep out mum’ to ‘come in world’: the bedroom as a cultural space for creative work. Paper presented at Cultural Spaces: Creative Places?, United Kingdom. Ashton, D. (2015). Locating creative workers within the creative economy. Winchester Cultural Conversations, United Kingdom. Ashton, D. (2015). She taught me to walk this way, she taught to p(l)ay this way: videogames walkthroughs, expert identities and paying audiences. Paper presented at Ludic Economies, United Kingdom. Ashton, D. (2015). Slow Media. Paper presented at Slow Media,public event in collaboration with Echo Park Film Center (LA) and Pound Arts, United States. Ashton, D. (2015). Taste, expertise and amateur filmmaking. Paper presented at Amateur Creativity: Interdisciplinary Perspectives, United Kingdom. Ashton, D. (2014). “Also get rid of any weeds you see”: contesting career pathways in film and television production. Paper presented at Creative Energies, Creative Industries (NECS 2014), Italy. Ashton, D. (2014). Community media. Community Media, United Kingdom. Ashton, D. (2014). Creative workers across the economy. Paper presented at UK Universities Week, United Kingdom. Ashton, D. (2014). Cultural work and critical pedagogies. Cultural Industries, Work and Value: AHRC Cultural Value Workshop, United Kingdom. Ashton, D. (2014). Practitioner-academics in media education: creative transfer and communities of practice. Paper presented at International Media Education Summit 2014, Czech Republic. Ashton, D. (2014). Producing cultural diversity in Britain in a day: amateur filmmaking meets the quality discourse. Paper presented at Community Filmmaking and Cultural Diversity: Practice, Innovation and Policy, United Kingdom. Ashton, D. (2014). Producing participation: Britain in a day and curating mass participation. Paper presented at MeCCSA 2014, United Kingdom. Ashton, D. (2014). Producing participation: Britain in a Day, amateur filmmaking and the quality discourse. Media Research Seminar Series, United Kingdom. Ashton, D. (2014). The career trajectories of creative graduates: pathways and portfolios for the creative economy. Paper presented at Higher Education and the Creative Economy, United Kingdom. Ashton, D., & Soyinka, B. (2014). The practitioner-academic: the struggles and successes of those who 'cross the divide'. Teaching Screenwriting: Creativity, Innovation and Professional Practice, United Kingdom. Ashton, D. (2013). Creative work. Paper presented at Creative Work Exhibition, United Kingdom. Ashton, D. (2013). I'd advise anyone contemplating this to find a separate wing to live in: Pride, Prejudice and spaces of cultural heritage. Paper presented at Spaces of Television: Production, Site and Style, United Kingdom. Ashton, D. (2013). Researching media education. Media Education Research Journal (MERJ)/HEA Researchers' Retreat, United Kingdom. Ashton, D. (2012). Cultural work and higher education. Media School Seminar Series, United Kingdom. Ashton, D. (2012). The expertise of illness: celebrity constructions and public understandings. The Social Construction of Illness and Death, Belgium. Ashton, D. (2012). Work placements in the creative industries: peer learning and the reflective practitioner’. Paper presented at GLAD Conference 2012: It started with a KIS!, United Kingdom. Ashton, D. (2011). Creative careers: education, employability, industry and identities. University of Reading, Faculty of Arts and Humanities Seminar on Employability, United Kingdom. Ashton, D. (2011). Creative labour and Higher Education. Paper presented at Moral Economies of Creative Labour, United Kingdom. Ashton, D. (2011). Creative work and higher education: Industry, identity, passion, and precarity. Shaping Things to Come, ADM-HEA Annual Forum, United Kingdom. Ashton, D. (2011). Enterprise, employability and identity: researching artswork media. Creative Enterprise Conference, United Kingdom. Ashton, D., & Juene, N. (2011). Reflections on practice: work-based learning, identity and professionalism. Paper presented at Media Education Summit 2011, United Kingdom. Ashton, D. (2011). The Jade effect: illness, mediated celebrity disclosure, and audience. Paper presented at MeCCSA 2011, United Kingdom. Ashton, D., & Feasey, R. (2010). "This is not how cancer looks": public understandings of celebrity and risk in the news. Paper presented at Celebrity News, Switzerland. Ashton, D., & Jeune, N. (2010). Artswork media: a work-related learning environment. The Creativity and Work Conference, United Kingdom. Ashton, D., & Jeune, N. (2010). Cultural work and creative agency: contexts and practical means. Paper presented at The Creativity and Work Conference, United Kingdom. Ashton, D. (2010). Digital gaming and the documentary form: agency, engagement and designed experiences. Paper presented at Documentary Now, United Kingdom. Ashton, D. (2010). Freelancing, moonlighting, networking, volunteering: cultural workers-in-the-making. Paper presented at The Future of Cultural Work, United Kingdom. Ashton, D. (2010). From the bedroom to beyond: identifying (with) industry tools and technologies. Paper presented at Affective Fabrics of Digital Culture: Feelings, Technologies, Politics, United Kingdom. Ashton, D., & Feasey, R. (2010). 'Not just documented but sold': Jade and death on the TV, radio, magazines, news, and the web. Paper presented at Death and the Media : Joint BSA Death, Dying and Bereavement Study Group and BSA Media Study Group Event, United Kingdom. Ashton, D. (2010). Positioning participatory production. Paper presented at DCRD Symposium: Access All Areas, United Kingdom. Ashton, D. (2010). Researching creative media work: Media Studies in/and the creative economy. Paper presented at Higher Education and the Creative Economy, United Kingdom. Ashton, D. (2010). Spectacular technologies, spectacular futures: showcasing perpetual innovation. Paper presented at Glorious Technicolor, Breathtaking CinemaScope Conference, . Ashton, D. (2010). 'You just end up feeling more professional': media production and industry-ready personhood. Paper presented at MeCCSA 2010, United Kingdom. Ashton, D. (2009). Students in studios and user-creativity in professional places: An analysis of media production, amateur interests and professional practices. Paper presented at Media Education Summit, United Kingdom. Ashton, D. (2009). User-generated archives, collective memory and prefigurative practices: a case study of digital walkthroughs. Paper presented at The Visual Archive: The Moving Image and Memory workshop, United Kingdom. Ashton, D. (2009). User-generated media and professions: machinima and the negotiation of industry transitions and professional practices. Paper presented at Ephemeral Media Workshop 1: Internet Attractions: Online Video and User-Generated Content, United Kingdom. Ashton, D. (2008). The professional in the age of the amateur: higher education and journalism on-the-job. Paper presented at The End of Journalism? Technology, Education and Ethics Conference 2008, United Kingdom. Ashton, D. (2007). Becoming serious and translating realms: online games in educational contexts?. Paper presented at Internet Research 8.0: Let's Play, Canada. Ashton, D. (2007). 'Game Studies and 'sub-Marxist gobbledegook': criticism in Higher Education digital games teaching. The London Games Research Group, . Ashton, D. (2007). Games for change: a cultural studies and social impact gaming dialogue. Paper presented at Cultural Studies Now, United Kingdom. Ashton, D. (2007). 'Simple, meaningful graphics': digital gaming counter-mobilisations and the politics of graphics. Paper presented at Aesthetics and Radical Politics, United Kingdom. Ashton, D. (2007). 'The games industry is a proud member of these industries': digital games industry-education collaborations and fostering creative talent. Paper presented at CRESC 2007: Re-thinking Cultural Economy, United Kingdom. Ashton, D. (2006). Values in design and politics and programming made ordinary. Paper presented at Ethnographies of Code, United Kingdom. I am a Senior Fellow of the Higher Education Academy (SFHEA) and hold a MA in Professional Practice in Higher Education. I have led two HEA funded research projects in relation to working in the creative and cultural industries, and published pedagogic research in journals including Journal of Further and Higher Education and British Journal of Sociology of Education. I have undertaken roles as an external examiner and on validation panels for several UK universities. From 2008 to 2015 I taught on the Media Communications and the Creative Media Practice degree programmes at Bath Spa University (UK). I joined WSA as the MA Programme Leader for Global Media Management in April 2015. MA Global Media Management explores critical understandings of the technological, social, cultural and political implications of changes associated with the global development of the Internet, social networks and mobile media. There is strong focus on media practice and applying academic debates and industry perspectives to the investigation of media organisations, consumers and audiences, and digital innovation. Case studies and research explored with students examine strategies and management techniques employed by commercial, non government (NGO) and community based (CBO) organisations, how creative ideas are developed, and how audiences and users respond to them, or generate their own media material. Distinctive parts of the programme include study visits, guest speaker lectures, and research-informed learning and teaching linked to the Winchester Centre for Global Futures in Art, Design and Media. Each year there is an annual symposium in which students on the programme join with invited academic researcher and industry practitioners to explore a specific theme. GMM has so far hosted the ‘Ludic Economies’ (2015), ‘Creative Organisations’ (2016) and ‘Data Visualisation’ (2017) symposiums. For more information please visit the MA Global Media Management course page. For updates please visit the WSA blog.